Evidence of the 1950s and 1960s was visibly apparent throughout Annette Ontell’s house. In contrast, you can see the influence of uber-postmodern aesthetics throughout the documentary her grandchildren made about her. Much of the film probably would have baffled Ontell, but she surely would have been proud of the sibling filmmakers anyway. 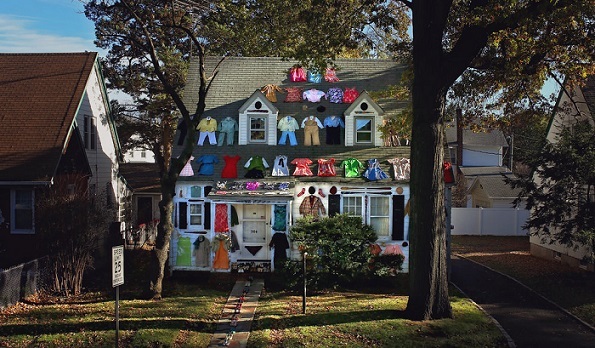 Elan and Jonathan Bogarín consider their grandmother through the prisms of archaeology and fashion, while struggling to catalogue the resulting clutter in the Bogaríns’ 306 Hollywood, which premiered last night at the 2018 Sundance Film Festival. 306 will be quite a programming challenge for many subsequent festivals. Ontell is an audience-pleasing kind of figure. For years, she put up with her husband, while building a reputation as an ultra-exclusive dress designer. Generally, she made only two of each chic frock—one for her Park Avenue clients and one for herself. They lived modestly, but comfortably in Newark at 306 Hollywood Avenue for decades. The Bogaríns also had the foresight to film her extensively during the last ten years of her lives. However, when it came time to box up the old house on Hollywood, the sibling filmmakers and their mother, Marilyn Ontell, were at a loss. Every dress told a story and every knick-knack seemed to hint at a wider narrative. Their dilemma took on spiritual-metaphysical dimensions when told by various experts the souls of the dead linger in their homes for eleven months. The family decides to keep the house during that time, so they can commence a psychological excavation of everything Ontell accumulated. As part of the process, they solicit commentary from pop culture physicist Alan Lightman, funeral director Sherry Anthony, and fashion conservator Nicole Bloomfield. The Bogaríns also incorporate a great deal of the footage they shot of Ontell in her late eighties and early nineties, some of which she would have probably preferred not to over-share. When a stray audio cassette is discovered, they even resort to using actors to lip-synch the scene. Yet, it is their representational collages that really would have made Ontell shake her head in confusion. They have cited Wes Anderson and Agnes Varda as influences, which definitely makes sense, that puts the film on the rather playfully experimental end of the spectrum, exactly where those most inclined to identify with Ontell will feel decidedly uncomfortable. Yet, this is such a rarified work unto itself, it is impossible to identify anything that does not belong. Frankly, this is the sort of film that ought to be preserved in a terrarium, much like the dioramas it features. Indeed, its colorful stylistic eccentricities are refreshing to those of us who have done our time with Marker and his followers. There is a lot of family love in 306 Hollywood that all viewers ought to be able to recognize and appreciate. There is also quite a bit of craftsmanship, some of which might be lost on its presumed target demo. If Ontell were not such a warm, motherly figure, we would definitely tag it as a better fit for experimentally minded documentary festivals like RIDM and DOXA, rather than Sundance. Recommended for viewers inclined to be both adventurous and sentimental, 306 Hollywood screens again this morning (1/19), Wednesday (1/24), and Friday (1/26) in Park City, as well as tomorrow (1/20) in Provo and Sunday (1/21) in Salt Lake, as part of this year’s Sundance.